The most pivotal aspects of mass communication – at just the right price. Media Essentials focuses on the pivotal aspects of mass communication, helping students better understand what the media is and the impact of the most vital recent changes on the mass-media landscape. 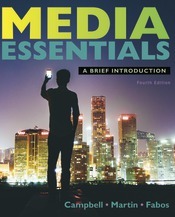 The new Media Essentials features an array of Digital Turn and Media Literacy boxes with specific, detailed case studies providing windows to broader ideas about the media, and a robust program of LaunchPad videos and Web clips that drive home the book's approach to media literacy, convergence, and analysis. In its fourth edition, this more concise and more affordable option for mass communication courses is more current, flexible, and informative than ever.